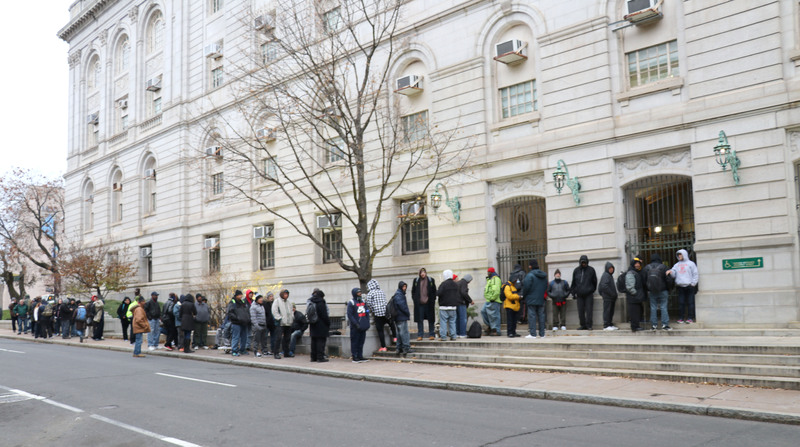 Despite a snowstorm, 300 homeless people attended our Winter Boot Party at Hartford City Hall on Dec. 9. They lined up early for new boots, socks, personal care items and more at a series of care stations. First stop? Hospitality, for a cup of Dunkin’s and healthy cereal bar, courtesy of DD’s and Whole Foods. Then onto Medical where our volunteer doctors gave much needed foot exams and a dose of compassion. Followed by new underwear from Church Army USA along with scarves and gift cards from friend Toni Sullivan, once homeless herself, now a paralegal in Manchester. A delish lunch to go was donated by Zest 280, Max Bibo’s, Community Renewal Team, and Carol Dupuis and Mike Haylon. Many volunteers helped that day and in the weeks before, collecting new and quality used boots (and cleaning them, too). Special shout-out to the recruits at Hartford PoliceAcademy for whom no task was too humble or demanding and to artist Jacque Metheny for designing our multiple flyers and posters. Since the Boot Party, our work continues–especially with the recent deep freeze. To date, we have helped more than 100 additional homeless people. We will continue to help, thanks to our big-hearted supporters. They include: Aetna, Balega Socks, Bombas, Church Army USA, Community Renewal Team, Dunkin’ Donuts, Episcopal Church in CT, (North Central Region) Hartford Bags of Love, Hartford County Bar Association Foundation, Hartford Foundation for Public Giving, Hartford HealthCare, Hartford Yard Goats, Insane Irving’s,Max Bibo’s, Robinson + Cole, St. Francis Hospital, St. Timothy Church, Starbucks, Trinity College Students, U Conn Hartford, Whole Foods, Zest 280. © Copyright 2019, Footwear with Care. All rights reserved. Footwear with Care is a registered 501(c)(3) nonprofit.